This year’s increase in seasonal tourism traffic may be accompanied by an increase in driver frustration as a pair of major road reconstruction projects impact upon turnpike interchanges in Fort Lauderdale and Orlando. The Florida Department of Transportation has been overhauling the I-595 corridor through Fort Lauderdale, Davie, Plantation and Sunrise since approximately November 2010. The project includes a complete reworking of the interchange with Florida’s Turnpike, with the bulk of construction work scheduled to be completed by March 2014, although work is currently ahead of schedule, according to a project construction chart. 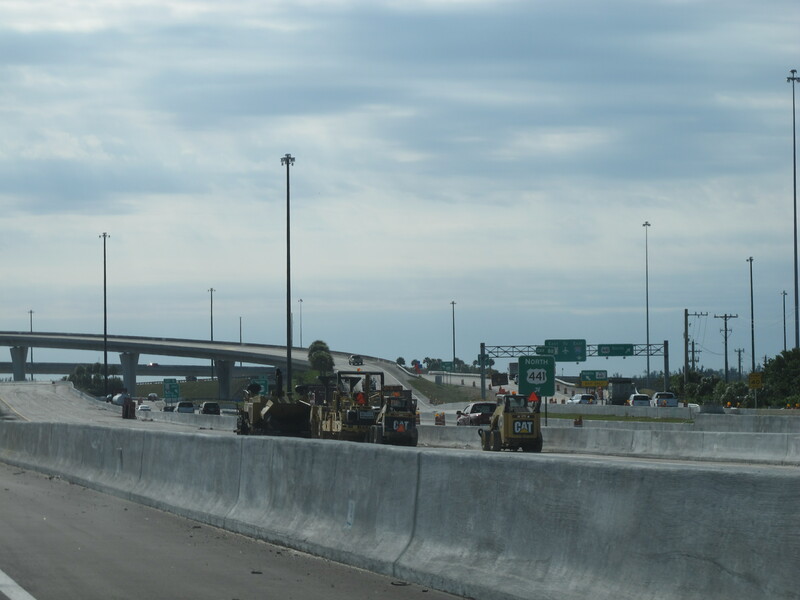 Meanwhile, lane additions and other construction has just begun in Orlando, where Florida’s Turnpike meets with I-4, just south of the East-West Expressway. The $10.2-million project at the Turnpike I-4 interchange began September 12, and it will not be completed until the fall of 2014, although a more specific date has not been provided. Drivers making their way through Orlando or traveling there as a destination will find exit and entrance ramps to I-4 being widened and realigned to handle more capacity. The construction effort also seeks to help increase capacity for truckers who make use of the interchange to access the Turkey Lake Service Plaza. Construction of the Florida’s Turnpike I-595 Interchange in the Fort Lauderdale-Davie area is within months of completion. Additional constructions delays may affect seasonal travelers, nonetheless. 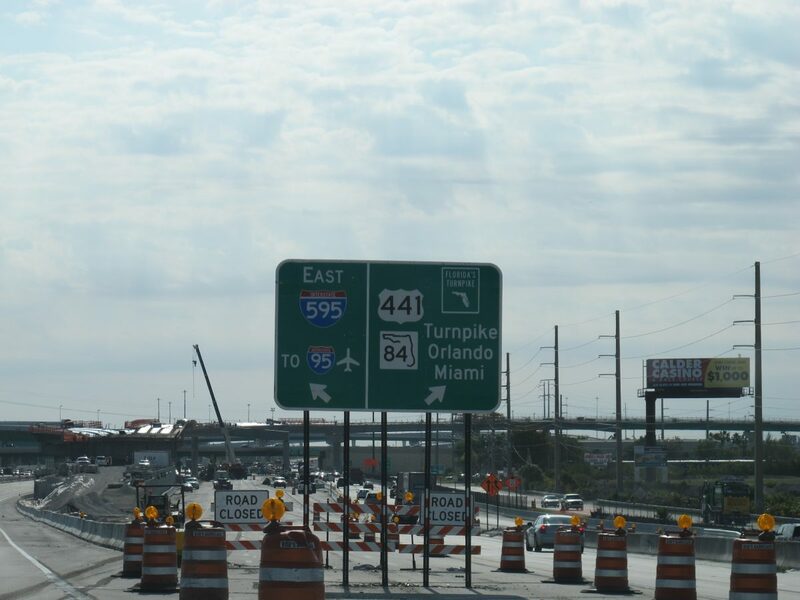 While the spate of lane closures and roadway detours is just beginning for Orlando, they are nearly completed for Fort Lauderdale’s Turnpike I-595 interchange. Overnight lane closures on the Turnpike, between I-595 and Sunrise Boulevard, were expected to be completed by the end of the week, this week. Ramp closures from State Road 84 and I-595 to the Turnpike were also expected to persist for a few more overnight hours, wrapping by September 27, according to a special website set up by Florida DOT to provide construction updates. Meanwhile, toll lanes continue to be closed on an intermittent basis in Miami-Dade County, where the all-electronic tolling booths are being built to replace the once-staffed toll collection booths. The closure of lanes chokes the traffic flow into the Golden Glades Interchange, which connects the Florida’s Turnpike with I-95 and the Palmetto Expressway (SR 826). The interchange also allows drivers to exit to U.S. 441 and NE 167th Street in North Miami Beach. The toll lane closures are expected to end by January 2014, around the start of peak seasonal tourism in Florida, but the short term outlook is one of slow traffic going into the Golden Glades. Only four toll lanes are currently open for northbound traffic leaving Miami, and five lanes are currently opened for southbound traffic making its way from Broward County into Miami-Dade. The widening of the Turnpike Extension in Miami-Dade County is also now underway, having broken ground in August 2013. The southern stretch of the Homestead Extension of the Turnpike will be widened to a minimum of six travel lanes in some areas, and as many as 10 travel lanes in other segments. The construction will affect the areas through Goulds and Cutler Ridge, from around SW 216th Street, north to Eureka Drive, which is also SW 184th Street. The project, which is expected to cost about $41-million, will take about three years to complete.